Fall is festival time for theatergoers in Seoul. While ensembles from all over the world play at places ranging from the National Theater on Namsan to Marronnier Park in Daehangno, the Chongdong Theater celebrates an important national anniversary: 100 years ago, for the first time a modern play was staged in Korea. 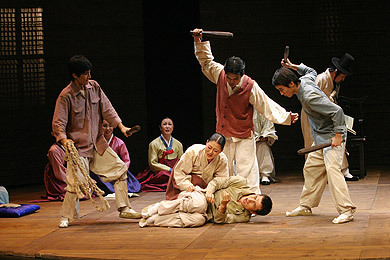 "Silver World" (original title: "Eunsegye") was based on a true story about the persecution of an innocent farmer by a corrupt government official. 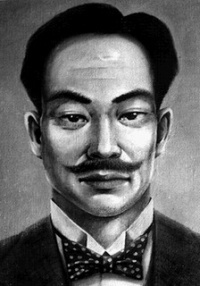 Through the medium of theater, scriptwriter Yi In-jik tried to promote his political position, favoring pro-Western Enlightenment over the yangban regime of the Joseon dynasty. 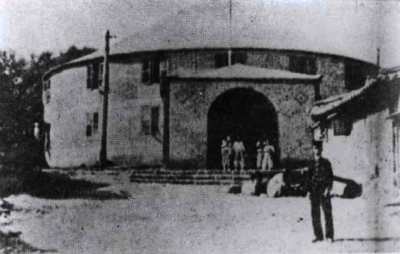 In November 1908 the play premiered at the Wongaksa, one of the first indoor stages in Korea and the first one devoted to modern productions. To celebrate the centenary of "Silverworld", Bae Sam-sik wrote a new eponymous play. It is currently shown at the Chongdong Theater that resides in the rebuilt Wongaksa, adjacent to Deoksugung palace in central Seoul. Bae's 2008 version of "Silver World" (director: Son Jin-chaek, Michoo Theater Company) is not a remake of the original. 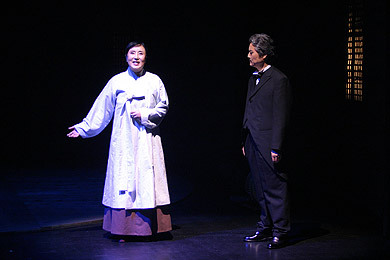 Instead the play tries to capture the time and spirit of the early 20th century when progressive Koreans, on the vigil of Japanese colonization, sought for ways of adopting Western modernism while at the same time staying true to their own cultural roots. Therefore Bae puts the focus more on the actual theater makers -- the singer-actors of the Wongaksa, the "anonymous stars" -- than the playwright Yi, whose reputation still suffers from his pro-Japanese attitude. He appears, however, in a few scenes that are set some time after the premiere of "Silver World". Yi (Jeong Tae-hwa) meets a mysterious lady (Kim Seung-nyeo) coincidentally at a train station. He had gone to Japan in order to study new trends in theatre there and had left the production of "Silver World" to other people. Now he returned home to finally see his play, but the lady (who turns out to be his former wife) informs him that it is not shown anymore. 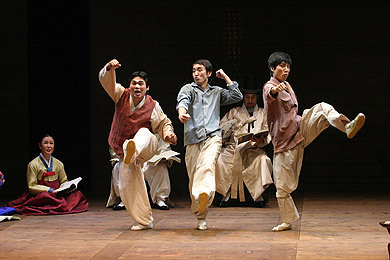 Stage director Gang Cham-bong (Kim Jong-yeop) encounters resistance when he wants to implement a new concept of theater. He plans to combine the singing style of Pansori (a traditional Korean one-person performance) with new plays staged in the way of Western spoken theater, eventually creating Sinyeongeug ("New Theatre", nowadays known as Changgeuk or "traditional Korean opera"). At first, this modern development faces reluctance from the old masters of Pansori who see their authority crumble, as well as from the young students, who make fun of the reformer. These scenes are put on the stage in an expressive way, featuring debates and some songs. Supported by his lead actress Heo Geum-pa (Kim Seong-ye), Gang finally pushes through, just to earn rejection from the audience. After the last scene projections complete the story of Wongaksa: Just a few years after its opening the concurrence of other, more successful theaters became too strong and it had to close, then, in 1914, the building burned to the ground. This end resembles that of a semi-documentary movie, the kind that tends to dwell in nostalgia rather than productively re-evaluate the past. And that was how the new "Silver World" appeared, all in all. This seems fitting for a theater whose proclaimed goal is to "keep the passion of traditional Korean arts alive". But why then was this play staged in the realistic style that is typically used for Western classics? Only some scenes of Changgeuk-ish performance lightened up this rather descriptive period piece. The power of performance to not only re-enact scenes but to actively create reality was not realized. 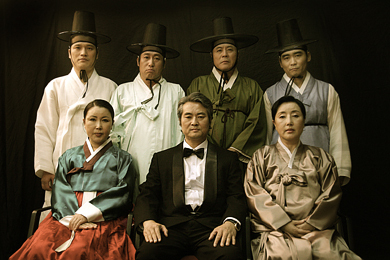 Even the conflict between tradition and modernity was represented only with standard devices: Hanbok, fan and the black yangban-head versus black suite, bow tie and walking stick. If decades of development towards a more engaged form of theater, initiated by the Sogeukjang Undong ("little theater movement") in the 60s, have passed unnoticed by the makers at Chongdong, maybe they should stick to the musical conservation of traditions. Or maybe use the occasion of the 100th anniversary of modern theater in Korea to think about new creative forms to adapt old performance practices to contemporary conditions. 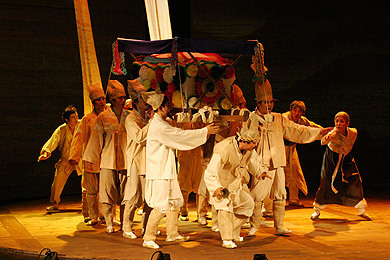 Korea's recent history offers various examples how traditional music and theater was utilized for modern causes, from Park Chung-hee's nationalistic cultural politics to the students' protest movement against the authoritarian regime. 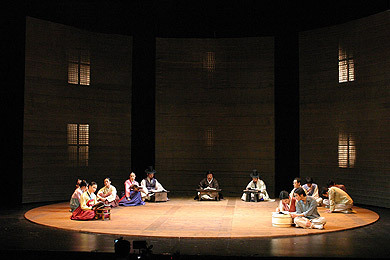 While the new "Silver World" works well as an introductory lesson to Korean drama history, a fresh approach on Pansori, Changgeuk and the politics of traditions would bear more potential for socially relevant theater -- and it would better fit Chongdong's claim to continue "the spirit of Wongaksa." "Silver World" (Eunsegye) is shown daily until October 19th. For details check out www.chongdong.com (Korean and English) as well as the homepage of the Michoo Theater Company (Korean only): www.michoo.co.kr. Andrei Lankov wrote an interesting article about Yi In-jik and the Wongaksa about a year ago in the Korea Times, see www.koreatimes.co.kr/www/news/opinon/2008/09/165_6797.html.